Equity and justice must be at the heart of the rules and regulations of the Paris Agreement. The Paris Rule Book must ensure that the agreement helps deliver climate action for the poorest and most vulnerable - those least responsible for the problem in the first place. This can only be done through strong accountability and transparency. Technologies are crucial for helping people to respond and adapt to the impacts of climate change, as well as for tackling greenhouse gas emissions. Technologies promoted and supported by the UN and national governments should focus on the needs of the most climate-vulnerable people. Smart technology choices can also have wider development impacts e.g. clean energy access, safe water, nutritious food, etc. 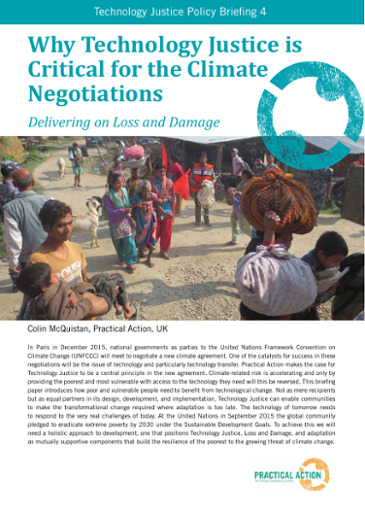 COP24 must deliver a Technology Framework which ensures the focus of technology development and transfer is to the most climate vulnerable populations, achieves a balance in addressing adaptation and mitigation technology support, and builds in the means to ensure that technologies are environmentally and socially sound. To do this, there needs to be enhanced support for scaling up access to existing and proven technologies, and not just new and emerging technologies, which often catch the eye of investors and ministers, despite their often limited impacts on the poorest and most vulnerable people. 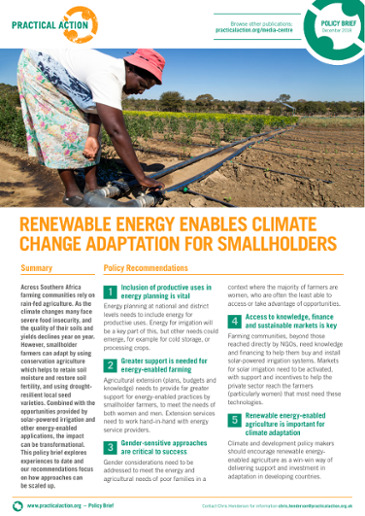 Intergovernmental support should focus not on the technologies which are already market-viable. Instead they should focus support on adaptation technologies which will deliver the greatest social impact, but which currently struggle to produce market-leading returns on investment. We need technologies to reduce the Losses and Damages caused by climate change where action is already too late; and to help the people least responsible for climate change to transform their livelihoods when impacts are irreversible and beyond adaptation. Loss and Damage must be treated as a separate, complementary component to adaptation and mitigation efforts. Insurance is currently the only significant source of finance committed to Loss and Damage, but insurance only pays for direct losses, and requires those least responsible for the problem to pay for the “solution” in the form of premiums for insurance coverage. The implementation of the Paris agreement must offer affected people the finance, technology, and capacity to give them a viable future. To this end, the Zurich Flood Resilience Alliance is working to increase social, political and financial investment in community-based flood resilience-building through public, private and third sector partnerships. Gender inequalities are exacerbated by climate change. Women are hit the hardest by the impacts of climate change due to societal gender inequalities related to their household and work roles, access to technologies, and greater reliance on natural capital for their livelihoods. This is brought into stark reality by pioneering new research from Practical Action Consulting on the gendered differences in impacts from flooding in South Asia and Latin America. But women can also be the most effective agents of change. Our work in Sudan with low-carbon cooking technologies has been highlighted as one of the groundbreaking Gender-Just Climate Solutions. Empowering women to lead the way in retailing improve cooking technologies has led to significant uptake of low-smoke stoves, while also reducing the deforestation from firewood collection which has damaged communities and their natural capital. Deep community engagement not only helps identify the key issues for the people most impacted by climate change, but also helps to ensure that they can help develop, and ultimately buy into, whatever strategy and technologies are chosen to address climate impacts in their communities. In Nepal, Practical Action have worked with the national government to formulate their new National Adaptation Plan (NAP). 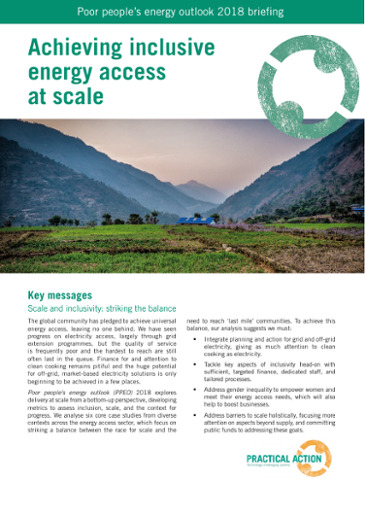 This has included not only highlighting the range of low-cost, high impact technologies we have pioneered in Nepal, but also to focus on strong engagement with the communities hit hardest climate change impacts, and ensuring their needs, ideas, and rights are prioritised in the NAP process. Development & Climate Days - How can shared learning processes on local climate action effectively influence policy and decision-making?